The Advances in Chemical Physics series presents the cutting edge in every area of the discipline and provides the field with a forum for critical, authoritative evaluations of advances. It provides an editorial framework that makes the book an excellent supplement to advanced graduate classes, with contributions from experts around the world and a handy glossary for easy reference on new terminology. This series is a wonderful guide for students and professionals in chemical physics and physical chemistry, from academia, government, and industries including chemicals, pharmaceuticals, and polymers. NEW ADVANCES IN MID-IR PULSE SHAPING AND ITS APPLICATION TO 2D IR SPECTROSCOPY AND GROUND-STATE COHERENT CONTROL (David B. Strasfeld, Sang-Hee Shim, and Martin T. Zanni). LOCAL CONTROL THEORY: RECENT APPLICATIONS TO ENERGY AND PARTICLE TRANSFER PROCESSES IN MOLECULES (Volker Engel, Christoph Meier, and David J. Tannor). DYNAMICS OF DOUBLE PHOTOIONIZATION IN MOLECULES AND ATOMS (John H. D. Eland). 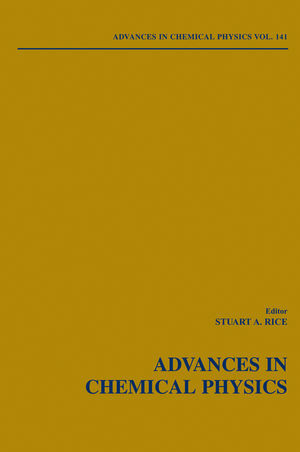 THE ELECTRIFIED LIQUID–LIQUID INTERFACE (R. A. W. Dryfe). THE PHYSICS OF ULTRATHIN SOLID–FLUID–SOLID FILMS: FROM SURFACE INSTABILITIES TO ISOLATED POCKETS OF FLUID (Gavin A. Buxton and Nigel Clarke). DYNAMICS OF THERMOTROPIC LIQUID CRYSTALS ACROSS THE ISOTROPIC–NEMATIC TRANSITION AND THEIR SIMILARITY WITH GLASSY RELAXATION IN SUPERCOOLED LIQUIDS (Dwaipayan Chakrabarti and Biman Bagchi). COMPLEX PERMITTIVITY OF ICE Ih AND OF LIQUID WATER IN FAR INFRARED: UNIFIED ANALYTICAL THEORY (Vladimir I. Gaiduk (deceased) and Derrick S. F. Crothers).